Most organizations have to think about mobile device management as more and more people are using either their own device or a company supplied device to access the organization's data. 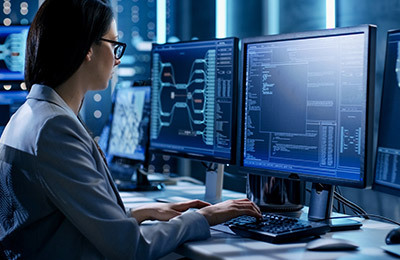 An ethical hacker is a person who attacks an organization's security on behalf of its owners in order to discover vulnerabilities, including mobile device vulnerabilities. Instead of taking advantage of these vulnerabilities, the ethical hacker reports them to the organization who can then put in place the appropriate countermeasures to protect themselves against malicious hackers. In this course, we look at how hackers target mobile devices and their users, the tools they use and the countermeasures you can implement to protect the organization. This course is one of a series of courses which can used in preparation for the Certified Ethical Hacker 312-50, exam. The course has been developed in partnership with EC-Council and is based on their Ethical Hacking and Countermeasures course materials and labs. Wireless networks pose unique security challenges and any wireless strategy must have security as a central requirement. In this course we look at hacking wireless networks, the associated tools and techniques used, and mitigation strategies. This course is the thirteenth in a series of courses which can used in preparation for the Certified Ethical Hacker 312-50 exam. The course has been developed in partnership with EC-Council and is based on their Ethical Hacking and Countermeasures course materials and labs. IDS systems are network hosts designed to monitor for signs of suspicious activity that may indicate an attack. Firewalls are the front-line of network defense against attacks, allowing or disallowing traffic based on rules. A honeypot is a trap host set to either detect attacks, or deflect them away from more sensitive hosts. This course covers the tools and techniques used in evading these three types of network security. An ethical hacker is a person who attacks an organizations security on behalf of its owners in order to discover vulnerabilities. Instead of taking advantage of these vulnerabilities, the ethical hacker reports them to the organization who can then put in place the appropriate countermeasures to protect themselves against malicious hackers. This course is the fifteenth in a series of courses which can used in preparation for the Certified Ethical Hacker 312-50, exam. The course has been developed in partnership with EC-Council and is based on their Ethical Hacking and Countermeasures course materials and labs. Web applications provide the interface between end users and web servers. In this course, we look at web application attacks, the associated tools and techniques used, and mitigation strategies. An ethical hacker is a person who attacks an organization's security on behalf of its owners in order to discover vulnerabilities. Instead of taking advantage of these vulnerabilities, the ethical hacker reports them to the organization who can then put in place the appropriate countermeasures to protect themselves against malicious hackers This course is the eleventh in a series of courses which can used in preparation for the Certified Ethical Hacker 312-50 exam. The course has been developed in partnership with EC-Council and is based on their Ethical Hacking and Countermeasures course materials and labs. SQL injection is a type of attack where code to manipulate a back-end database is entered into a web application. This code could be a means to harvest authentication information, escalate privileges, or simply cause a denial-of-service. In this course, we look at SQL injection attacks, the associated tools and techniques used, and mitigation strategies. An ethical hacker is a person who attacks an organization's security on behalf of its owners in order to discover vulnerabilities. Instead of taking advantage of these vulnerabilities, the ethical hacker reports them to the organization who can then put in place the appropriate countermeasures to protect themselves against malicious hackers.This course is the twelfth in a series of courses, which can used in preparation for the Certified Ethical Hacker 312-50 exam. The course has been developed in partnership with EC-Council and is based on their Ethical Hacking and Countermeasures course materials and labs. Buffer overflow attacks exploit vulnerabilities in an application due to mishandling of occurrences of data buffers being presented with more data than they were intended to hold. This course looks at buffer overflow attack methodology and tools, and countermeasures. This course is the sixteenth in a series of courses which can used in preparation for the Certified Ethical Hacker 312-50, exam. The course has been developed in partnership with EC-Council and is based on their Ethical Hacking and Countermeasures course materials and labs.